Esperanza Spalding Named Artistic & Community Ambassador by Portland Jazz Festival. PDX Jazz, the presenting organization of the Alaska Airlines/ Horizon Air Portland Jazz Festival presented by U.S. Bank, announce the appointment of Esperanza Spalding as Artistic & Community Ambassador. 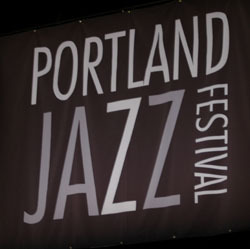 The Celebrated bassist, vocalist, composer and bandleader will officially begin her newly appointed position effective October 14 at the kick-off press conference for the 2011 festival to be held February 18 through 27 in downtown Portland, Oregon. Read more.